Kapu Kaʻū is a unique portrait of one of Hawai‘i's most remote and rugged districts, Ka‘ū, located on the southern flanks of Mauna Loa on the island of Hawai‘i. The people of Ka‘ū, known historically for their independence and resilience, relate stories of a lifestyle closely tied to the land and the sea. Viewers are guided through the verdant uplands by long-time elders who recall traditions of growing taro, hunting pig and branding cattle at Kapāpala Ranch. A tour of the shoreline by area residents reveals ice cold freshwater ponds at Nīnole, rich fishing grounds at Punalu‘u, salt gathering areas at Kamilo, green sea turtles and the famous ʻiliʻili stones of Kōloa. Ka Lae, also known as South Point, the southernmost point in the Hawaiian islands, is famous for its ancient sites: Kalalea heiau, canoe mooring holes, habitation caves, burial grounds and house foundations. It is an area honored by Maori tribes as the departure point for voyages to Aotearoa (New Zealand) centuries ago. In spite of the beauty and special significance of this district, it has been impacted by many outside influences, from hundred-year-old sugar plantations to modern-day resort and spaceport development plans. Kapu Ka‘ū shows the determination and continuing efforts by residents to keep Ka‘ū kapu, or sacred. Palikapu Dedman, Adeline Andrade, Pele Hanoa, George Manuel, John and Chris Kalani, Sam Kaluna, Chris Bangay, Lono Ke, David Kanakaole, Minerva Akiu, Caroline and Joe Kauwe, Hanoa Paaluhi, Sam Hui, Bernard Keliikoa, Archie Kaawa, Lily and William Ahia and John Wailani. 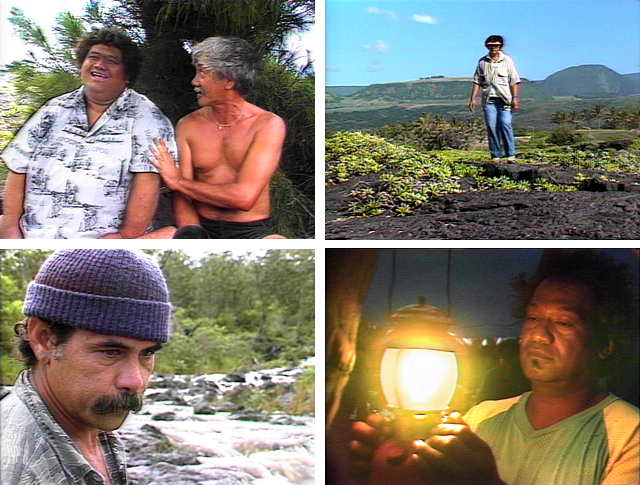 The program was produced by Nā Maka o ka ‘Āina in association with Ka ‘Ohana o Ka Lae ("the family of Ka Lae”).